BACKGROUND AND PURPOSE: While CT has found wide use in medical practice, it is also a substantial source of radiation exposure and is associated with an increased lifetime risk of cancer. There is an urgent need for new approaches to reduce the radiation dose in CT. In this regard, ASIR is an alternative method to FBP. We assessed the effect of ASIR on dose reduction in adult head CT.
MATERIALS AND METHODS: We retrospectively evaluated a sample of 149 adult head CT examinations that were divided into 2 groups, STD and LD. We lowered the tube current and used ASIR in the LD group. SNR and CNR were analyzed. Dose parameters were recorded while subjective image noise, sharpness, diagnostic acceptability, and artifacts were graded. The Student t test, the Mann-Whitney U test, and κ statistics were used for statistical analyses. RESULTS: We achieved a dose reduction of 31% in the LD group (STD, 2.3 ± 0.1 mSv; LD, 1.6 ± 0.1 mSv; P < .001). There was no significant difference in the noise measured in the air between the 2 comparison groups (P = .273). Noise in the CSF was higher in the STD group (P < .001), while the noise in the WM was higher in the LD group (P < .001). Differences in the CNR between groups were insignificant, but the STD group displayed better SNR values. There was no significant difference in the modal scores of diagnostic acceptability (P = .062) and the artifacts (P = .148) between the 2 groups. Better scores for subjective image noise (P < .001) and sharpness (P = .04) were observed in the STD group. CONCLUSIONS: ASIR appears to be useful in reducing the dose in adult head CT examinations. While the effect of ASIR on noise reduction observed in the present study of head CT is less than that reported previously in abdomen and chest CT, these findings encourage further prospective studies in larger patient samples. Recently, some of the mathematic methods for reconstruction that have been known since the 1970s have been used for CT research and practice. These methods remove the noise from the image by means of iterations. Notably, iterative reconstruction has been used in positron-emission tomography but could not be implemented in CT until now because calculations required for these methods can only be performed with recently developed high-performance computer processors. Noise is inversely proportional to the square root of the dose. By lowering image noise, these methods can, conceivably, be used to reduce radiation dose. Indeed, clinical studies supporting this hypothesis have been reported, describing the use of iterative reconstruction methods such as ASIR—a name given by the vendor (GE Healthcare, Milwaukee, Wisconsin)—in abdomen6–8 and chest CT9–11 and coronary CT angiography.12–14 On the other hand and most important, the role of ASIR in head CT has never been reported to date, to our knowledge. The aim of the present study was to assess the effect of ASIR on dose reduction in adult head CT by using a 16-section multidetector row CT scanner. While the reported observations herein derive from a retrospective examination, we submit that they contribute to the emerging knowledge base on the utility of iterative methods to achieve CT dose reduction. This retrospective study was reviewed and approved by the Gazi University Institutional Review Board. From July 1, 2010, to August 31, 2010, 149 consecutive patients who underwent head CT with a 16-section multidetector row CT scanner (BrightSpeed, GE Healthcare) were examined retrospectively in the present study. There were 2 groups of patients: 1) the STD group comprising 51 patients (28 men, 23 women; mean age, 52.0 years; range, 20–91 years) who went through the STD and standard reconstruction algorithm (FBP) head CT protocol before implementation of ASIR in our protocols; and 2) the LD group comprising 98 patients (44 men, 54 women; mean age, 55.5 years; range, 19–94 years) who were examined with LD and a mixture of ASIR and FBP reconstruction algorithm head CT protocols after implementation of ASIR as a departmental policy. Only adult patients were examined in the present study because, in our department, different protocols are used for children of different age groups. Hence, our focus on adult patients ensured consistency in the protocol used in the present study sample. Moreover, to have adequate noise measurements, patients with images with severe streak artifacts caused by foreign bodies, metallic surgical materials, and movement of the head were excluded from the study. Emergency patients, who were scanned with a faster helical mode protocol, were also excluded. Only noncontrast studies were included, while patients' follow-up examinations were excluded. A lateral scout image with 100 kV (peak) and 20 mA was obtained to define the scan area prior to axial imaging. Scanning parameters of the STD group wre 170-mA tube current, 2-second tube-rotation time, 140-kVp tube voltage, 4 × 2.5 mm section thickness, 25-cm FOV, a standard reconstruction algorithm for the posterior fossa; and 270-mA tube current, 1-second tube rotation time, 120-kVp tube voltage, 2 × 5 mm section thickness, 25-cm FOV, a standard reconstruction algorithm for the cerebrum. A routine reconstruction algorithm of FBP was used. The same protocol except with lowered mA settings (125 mA for the posterior fossa, 190 mA for the cerebrum) and the addition of ASIR (30%) was used in the LD group. Thirty percent ASIR means a blend of 30% ASIR and 70% FBP. ASIR percentage can be selected in a spectrum of 0%–100%, where 0% means all FBPs and 100% means all ASIRs. With the increase in the percentage, noise decreases. At higher levels, contours of the structures begin to blur.6,11 With the vendor's suggestions (30%–50%) and our initial experience, we chose 30% by consensus in our department. Image noise, defined by a percentage SD of the mean CTn within a region of interest, was measured in the air, CSF, and WM. A region of interest (60 mm2) was placed in the air on the 3 consecutive sections at the level of the posterior fossa, and an average of the measurement of 3 sections was used for comparison. A place with minimum streak artifacts and maximum 1-cm distance away from the patient was chosen. We measured noise in the CSF in a subgroup of patients (82/98, 84%, LD group; 38/51, 75%, STD group) whose lateral ventricles were suitable for drawing a region of interest of ≥15 mm2. A third region of interest of 40 mm2 was placed in the WM at the level of centrum semiovale. Moreover, the CNR and SNR were analyzed as described in the literature.16–18 For CNR, 3 regions of interest of 4 mm2 were placed in the WM and 3 regions of interest of 4 mm2 were placed in the GM at the level of centrum semiovale without causing partial volume effects. CTn and SD values were recorded and averaged for each part. CNR was calculated by using a standard equation: (mean GM CTn − mean WM CTn)/[(SD GM)2 + (SD WM)2]1/2. For SNR, 3 regions of interest of 20 mm2 were placed in the WM at the level of centrum semiovale. CTn and SD values were recorded and averaged. SNR was calculated by dividing the CTn by the SD. Examinations were reviewed in a random manner at the same workstation (Advantage Windows 4.4, GE Healthcare) by 2 radiologists working independently (G.E., 10 years' experience; K.K. 8 years' experience) who were blinded to the protocol, ASIR usage, and date. Image noise, sharpness, diagnostic acceptability, and artifacts were graded. A second-year resident (M.G.) helped in the interpretation process by removing all the information on the monitor and anonymizing the patients. Window level (40–60 HU for the posterior fossa, 40–50 HU for the cerebrum) and window width (80–100 for the posterior fossa, 50–70 for the cerebrum) were kept within predefined limits for all images. Subjective noise was graded on a 4-point scale: 1, little, best noise; 2, optimum noise; 3, noisy but permits evaluation; and 4, too much, which degrades the image so that no information can be gathered. Sharpness was graded on a 5-point scale according to WM and GM differentiation; visualization of the basal ganglia, pons, and ventricular system; and CSF space around the mesencephalon and over the brain: 1, Structures are well-defined with sharp contours; 2, better seen but contours are not fully sharp; 3, structures can be seen, contours are sharp enough, diagnostic information can be retrieved; 4, structures can be visualized but not enough for diagnostic reporting; contours are blurred; and 5, structures cannot be defined. We compared the STD and LD groups by using quantitative measurements and qualitative modal scores. For modal score comparison, the average of the scores of the 2 readers was used. An unpaired Student t test was used for continuous variables, and a Wilcoxon rank sum (Mann-Whitney U) test was used for categoric variables. A statistically significant difference was P < .05. The degree of interobserver agreement was determined by using κ statistics (Statistical Package for the Social Sciences, Version 13.0; SPSS, Chicago, Illinois). The differences in the ages and number of images were not significant (P > .05). After lowering the tube current, we achieved a significant dose reduction of 26% in the CTDI of the posterior fossa, 35% in the CTDI of the cerebrum, and 31% in the DLP and ED (P < .001) (Table 1). The quantitative and qualitative measures are presented in Table 2. Noise measured in the air and CSF in the LD group was less than that of in STD group, with insignificant difference in the former (P = .273) and a significant difference in the latter (P < .001). On the other hand, when we measured noise in the WM, we found higher noise values and lower SNR in the LD group than in the STD group (P < .001). The difference in the CNR values was insignificant (P = .349). There was no significant difference in the diagnostic acceptability (P = .062) and artifacts (P = .148) between groups. None of the images of the patients were graded as diagnostically unacceptable. Two patients (1 from the LD group, 1 from the STD group) had scores of 3 (Fig 1), and 2 patients (both from the LD group) had scores of 2.5. The rest of the patients (97%, 95/98, of the LD group; 98%, 50/51, of the STD group) had scores ≤2 (Fig 2). None of the patients had artifacts that impeded evaluation. 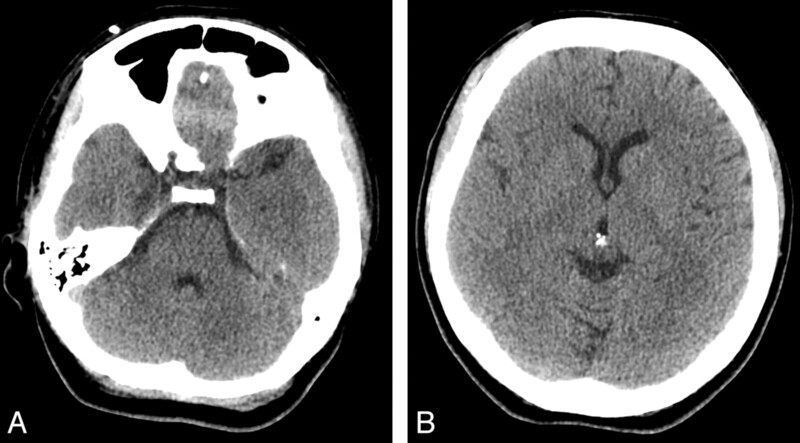 Axial images of a 34-year-old woman with normal findings at the level of the posterior fossa (A) and basal ganglia (B). The patient belongs to the LD group (DLP, 832 mGy×cm). Note that the WM and GM differentiation is decreased. This is 1 of the 2 examinations that are considered diagnostically acceptable only under limited conditions (score of 3 for diagnostic acceptability criterion). Axial images of a 45-year-old woman (A and C) from the STD group (DLP, 1100 mGy×cm) and a 37-year-old man (B and D) from the LD group (DLP, 713 mGy×cm) are compared. Both examinations have good WM and GM differentiation and are considered fully acceptable (score of 1 for diagnostic acceptability criterion). A and B, Posterior fossa. C and D, Basal ganglia. Modal scores for subjective image noise (P < .001) and sharpness (P = .04) were better in the STD group. However, all patients in both groups were considered suitable for reporting, thus having scores of ≤3 for both criteria. Interobserver agreements were moderate for image noise (κ = 0.556), sharpness (κ = 0.539), and diagnostic acceptability (κ = 0.540) and substantial for artifacts (κ = 0.613). The differences between the scores of the readers never exceeded 1 in any criteria. The visual scores for both readers are given in Table 3. The vendors tend to implement their own iterative image reconstruction methods to achieve dose reduction without image-quality degradation (GE: ASIR; Siemens, Erlangen, Germany: Iterative Reconstruction in Image Space21–23; Toshiba Medical Systems, Tokyo, Japan: Adaptive Iterative Dose Reduction; and Philips Healthcare, Best, the Netherlands: iDose.24 With these methods, 30%–80% dose reduction is expected. By adapting ASIR into our protocols, we observed a reduction in the head CT dose by 31% in the LD group without compromising the CNR and diagnostic acceptability. Similar reductions were reported in abdomen CT by Hara et al (29%–65%),6 Prakash et al (25.1%),7 and Sagara et al (33%)8 and in chest CT by Prakash et al (27.6%).10 Notably, Flicek et al25 were able to reduce the dose by 50% in their study, in which they compared an STD supine set with an LD prone set with ASIR in a CT colonoscopy examination without degrading image quality. We achieved different levels of noise reduction across the image plane. Noise measurements in the air revealed insignificant differences between the LD and STD groups. We found lower noise levels in the CSF of the LD group than of the STD group. However, unlike the above-mentioned studies, with these reduced levels of dose, WM measurements (noise and SNR) and visual scores of noise were better in the STD group. Our results were in concordance with those of Marin et al.26 By using the noise power spectrum curve, they showed that the effect of ASIR on the noise reduction was more noticeable in the smoother areas than in the grainy areas. In light of these findings, we propose that less aggressive noise reduction (<30%) should be aimed at head CT examinations if keeping the noise at routine levels is desired. Because 97% (95/98) of the examinations in the LD group were considered fully or probably acceptable for diagnosis, we have kept using LD settings as our routine head CT protocol. We observed better image sharpness scores in the STD group than in the LD group. Sagara et al8 also reported the same finding without affecting the diagnostic acceptability. We attributed this to the oversmoothing effect of ASIR as well as to the noise. At higher levels of ASIR, contours of structures begin to blur and sharpness decreases.6 Even if we chose a low ASIR percentage (30%), we could not prevent the sharpness from degrading. Minor artifacts seen in both groups were expected such as beam-hardening artifacts at the posterior fossa. Higher tube settings were used in the posterior fossa to decrease the magnitude of artifacts. We did not observe any artifacts in either group that made interpretation impossible. There are limitations to our study. First, we disregarded patients with images with severe artifacts caused by foreign bodies, metallic surgical materials, and movement of the head, which might have also been compared. They were too small in number for a healthy comparison to be made; thus, larger series are needed. Second, we used a small region of interest (60 mm2 for air and 40 mm2 for WM). This could not be prevented because of a lack of space in and around the cranium. Therefore, to overcome this, we made measurements on 3 consecutive sections and averaged them. Third, we did not verify our results with different scanning and reconstruction settings. Our findings should be validated on a head phantom and should be correlated with different detector configurations. Fourth, we did not assess the diagnostic accuracy or the effect of ASIR on the different disease subgroups in this study. Larger prospective series are warranted for this. For the future studies, ASIR can be used in conjunction with other dose-reduction methods, such as automatic tube-current modulation. 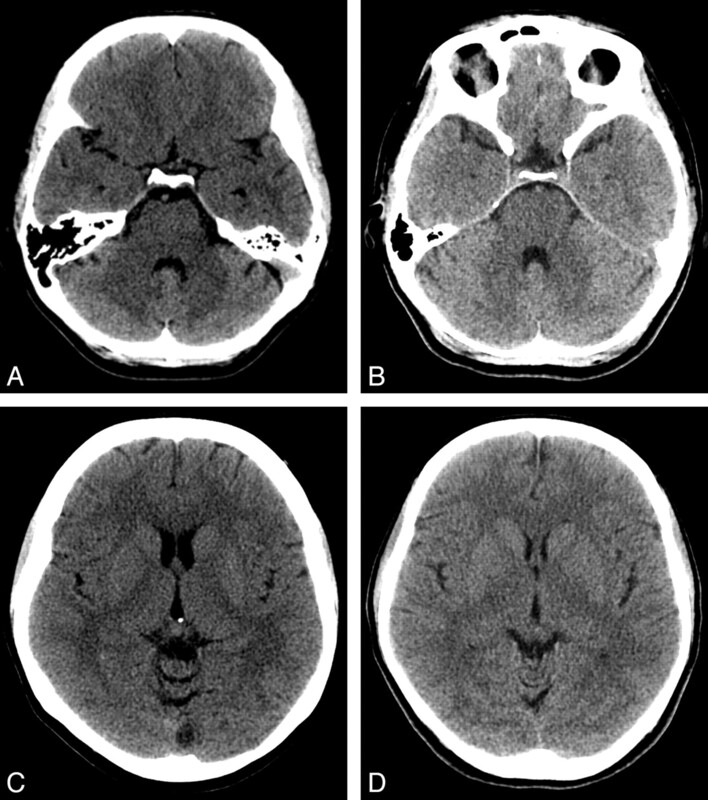 Smith et al5 proposed that automatic tube-current modulation could be used as an effective dose-reduction tool for head CT. Therefore, when incorporated with ASIR, more dose reduction would be possible. In addition, although we did not assess the diagnostic accuracy or the effect of ASIR on the different disease subgroups in the present study with a limited sample size, we suggest that future studies in a larger sample might consider such further stratified analyses. ASIR appears to reduce the dose in adult head CT examinations performed on a 16-section multidetector row CT scanner without compromising the diagnostic acceptability. While the effect of ASIR on the noise reduction observed in the present study of head CT is less than that reported previously in abdomen and chest CT, these findings encourage further prospective studies in larger patient samples. Accepted after revision February 5, 2011.